I met my friend Doralice for dinner last night at Spoonbar. Wow! What an incredibly good meal we had. Neither of us had eaten there since the new chef arrived and we both agreed that we waited too long. We gorged ourselves on six courses and shared everything; warmed sourdough with oyster butter, shrimp with granola (I know, it sounds weird, but it was AMAZING), sunchokes roasted in brown butter, broccolini, chicken and black cod. We were in food heaven as we sipped specialty cocktails between bites. All of this was afforded to us with my prized gift certificate for winning Spoonbar’s limerick contest this past St. Paddy’s Day. I know, it took me awhile to get there, but I’m really glad I waited because the timing was perfect to share this meal with my friend. Doralice is the owner of The Cheese Shop here in Healdsburg and a few months back she offered to help me downsize my storage unit. There were some things I wanted to sell and things I wanted to donate. She offered to put some items in her shop (furniture!) to sell so that I could make a little extra cash and the proceeds from smaller items would be donated to The Living Room, a charity that assists homeless and at-risk women and children in Sonoma County. A couple of weeks ago, Doralice arranged for two friends and a truck to meet me at my storage unit to pick up the stuff. Three trips worth! I am so grateful. I have been struggling with a large monthly payment for this unit and as of November 1st, I will be in a much smaller unit and have that big monkey off my back. Yay! I visited the shop last week. Among all the yummy goodness of artisanal cheeses and specialty foods sat my storage stuff. Well, not really among the edible items. She has a good sized shop and a designated spot, but it really was quite comical. Her father now refers to her as Sanford and Son. Also funny are the pictures she has been posting on The Cheese Shop’s Facebook page (Like it!) of items for sale. There in my newsfeed is a picture of my chair. I seriously can’t thank her enough. And a big thank you to another friend, Amanda, who also has a few items in her shop, too. Here’s my winning limerick in case you missed it in March and thank you, Spoonbar, for our delicious dinner. who’s green eyes were as bright as her mojo. cuz she learned how to fight in a dojo. 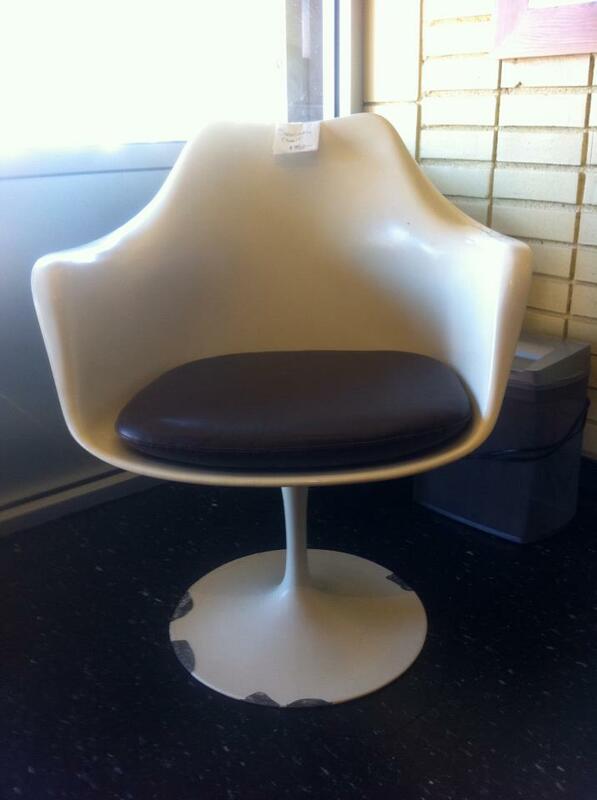 And here’s an original Saarinen tulip chair that’s still for sale for you mid-century furniture lovers. A love these “slice of life” posts, Jodee! Thank you.